juice of 1 lemon, squeeze onto diced apples to prevent "rusting"
Cook the pasta for half the time it says on the packet. Drain, butter, and set aside. In a heavy-based pan large enough to hold the pasta, heat olive oil. Put in garlic, parsley, thyme, red pepper flakes. Saute til just before garlic turns color. Put in the ham. Season with salt & pepper. Cook ham til browned. In another heavy-based pan, melt butter. Heat til very hot, but do not brown. Drain the apples. Cook in the butter til they begin to caramelize. Pour in brandy. Bring to a boil, then simmer 5minutes. Put in the crème fraîche. Lower the heat. When just heated through, turn the fire off. Put in the nutmeg. Toss with the noodles. Check seasoning, top with Parmesan cheese & some extra minced parsley, and dig in. I meant to make a side dish of garlic enoki mushrooms but I just didn't have time for that anymore so I served the pasta by itself. 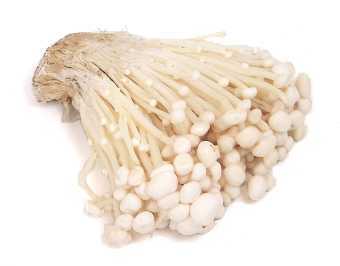 Enoki mushrooms are tiny little mushrooms that I thought would add great texture to the pasta, and make for an interesting presentation. I'm putting the recipe here but first, some notes on the pasta. I always half-cook pasta & finish cooking in the sauce. That way they absorb flavor. In any case I'm sure you guys know how to cook pasta al dente. If you follow the timing printed on the packet your pasta'll be overcooked. Pasta-cooking water should always be salted (1 Tbsp/ 1L water). Some people like putting in oil. That prevents noodles from sticking, but also prevents sauce from staying on the noodles. When your noodles are done, drain them immediately but unless you're making lasagna NEVER rinse them under cold water (makes your noodles rubbery) Just butter them lightly and set them aside. About the brandied apples, I just cooked them in brandy but if I make this dish again I would flambé them. Oh yeah, you don't have to use lemon juice to preserve diced apples while they're on standby. What I actually did was this: Mama happened to be baking something with canned fruit cocktail in it, and so I asked her to save the preserving liquid and I put my diced apples in that. The whole idea behind this dish is to have the mild sweetness of the apples be there as something interesting--something you wouldn't normally see in a pasta dish--but you don't want this to be a sweet dish. You want the saltiness of the ham to still assert itself. The whole reason behind the red pepper is to veer the diner's senses away from a "this is a dessert" feeling. You don't want the sweetness overpowered either, or else the novelty is gone. You gotta find a good balance. The first incarnation of this dish (which I did close to a year ago) used cayenne pepper and didn't have any liquor in it. It tasted like a kiddie dish, in spite of the pepper. Preparing for Dine & Jam, I added parsley for more interesting color, and switched from cayenne to dried red pepper flakes for the same reason. Added the thyme to the saute instead of at the end so the ham takes on more flavor, and tried using wine. I love cooking with wine, but for this dish it didn't work. Too sour. As soon as I thought of using brandy instead I knew I had my recipe. Heat the oil. Add parsley, garlic, and seasoning. Cook briefly. Toss in your shrooms. Fry til golden. Serve hot, sprinkled with Parmesan cheese. The 7th installment of Dine & Jam is coming up! Dine & Jam is a monthly celebration of the gift of music, love of cooking, and the joy of friendship. Each month will feature live music, and new dishes from The Regali Kitchen. Dine & Jam 7 promises to be yet another fun-filled night featuring the music of Bossa Resound, plus undiscovered talents. For ticket reservations call 2595421. Tickets are at 175php inclusive of a full pasta meal.